If buying an Italian car made in Japan sounds absurdly Fellini-esque, it's exactly the scene now unfolding at Fiat dealerships. Fiat's new 124 Spider is made in a Mazda plant in Hiroshima, on the same assembly line as the MX-5 Miata. Odd though it may sound, there's precedent. Legend has it that famous Italian trader Marco Polo brought pasta to Italy from Asia in the 13th century, and that, we can probably all agree, turned out fine. The likenesses run deep in these two roadsters. Both have the same 90.9-inch wheelbase and unibody structure. The control-arm front- and multilink rear-suspension layouts are identical, except each has its own springs, dampers, and anti-roll bars. Here's more international intrigue: U.S.-based Fiat engineers aided in the 124's suspension tuning. Marco? Polo! There's so much Miata in the 124 Spider that it's just easier to run through the differences. Under the hood, the Miata comes with a naturally aspirated 2.0-liter four with 155 horsepower and 148 pound-feet of torque. The 124 has an Italian-made turbocharged SOHC 1.4-liter four with 164 horsepower in Abarth guise (160 in regular strength) and 184 pound-feet of torque. A close relative of the Fiat 500 Abarth's engine, the 124's has four more psi of boost than the Cinquecento and is adapted for life in a rear-drive car. Telling the two apart is easy. The Fiat is the one with the tacky Abarth badges that look big enough for a pickup. Longer by 5.5 inches than the Mazda, the Fiat has its own bodywork that borrows cues from the origi*nal 124 Spider. 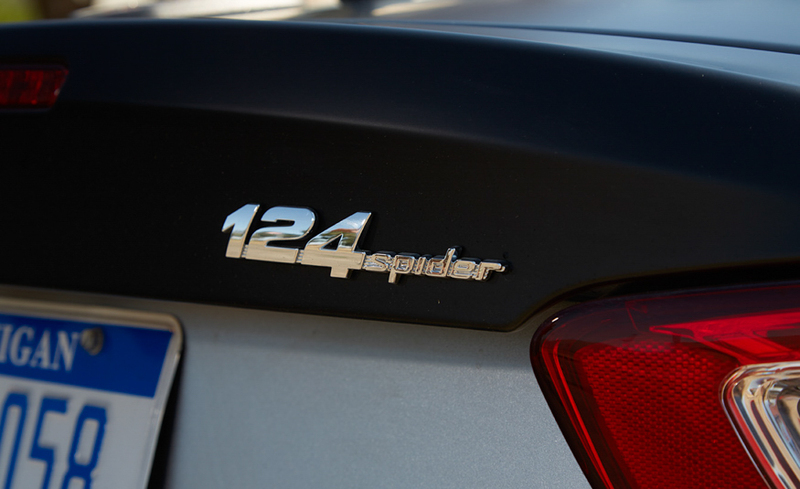 Built from 1966 to 1985, the 124 Spider's svelte namesake was as Italian as cappuccino and engine fires. Familial cues include the headlight cutouts, grille shape, and hood contours, plus the character line running down the Fiat's flanks. There aren't many visible differences between the Italian and the Japanese inside; the 124 Spider has its own gauge faces, different door panels, some softer trim, and Fiat badges. Less obvious are the Fiat's acoustic windshield, thicker rear glass, and the extra sound deadening under the carpet and along the firewall. Those things add up. Take both to the scales, and the 124 Spider is a hefty 193 pounds heavier than the Miata. To pick our favorite fraternal twin, we vectored toward the canyons north of Ojai, California, and one of our favorite roads, State Route 33. The site of an ongoing battle between blacktop and talus slopes, 33 inks through the browning vegetation of the Los Padres National Forest. It's best at dusk, right as the sun has its last dance with the canyons. With a car's top down, you can hear the exhaust echoing off the rocks and feel the heat from the road rising into the cabin and the dry air becoming satin. Driving doesn't get much better than this. But despite all their similarities, one of these roadsters is better than the other. When you start with something as pure and good as a Miata, it's difficult both to improve on it and to completely muck it up. Fiat hasn't made a better Miata, but it hasn't ruined it, either. Fiat's biggest misstep-adding power-actually seems like a good idea on paper. The reality is that the 1.4-liter turbo is a lag-filled look at the pitfalls of turbocharging. Below 2500 rpm, the engine appears to run on Sleepytime tea. A saunter from 30 to 50 mph in sixth gear takes 13.6 seconds, almost three seconds longer than the *Miata's time, and only a half-second quicker than a manual Ford Focus with the 1.0-liter three-cylinder. Waiting this long is usually accompanied by an old issue of People *magazine or Highlights for Children. And yes, we realize that any sentient driver would downshift when faced with such a delay, but our top-gear acceleration test does highlight the car's complete lack of motivation before the turbo wakes up. Shifting the Fiat's six-speed was a pleas*ure, but then we drove the Mazda again. Fiat actually uses the previous-gen Miata's six-speed gearbox to cope with the turbo's torque. Throws are satisfyingly short, but the 124's efforts are higher than the Miata's. The clutch takeup is more abrupt, and the pedal requires greater leg strength. Slip the stubby shift knob into lower gears, and there's still a wait. Even in first gear, pulling away from a stop requires patience. The 5-to-60 sprint requires 7.6 seconds, 0.8 second slower than the Miata. When the boost finally makes an appearance, it comes on all of a sudden. And that surge of acceleration tapers off quickly past the 5500-rpm power peak. Launched with a 4400-rpm clutch drop, the Spider will arrive at 60 mph in 6.7 seconds, a significant half-second behind the Mazda. A Miata with torque is a concept we can get behind, but the Fiat's push comes with a price: a delay that accompanies every request for power. And while the Fiat is busy lighting its turbo fuse, the Mazda just bolts. Absent here are the Miata's direct responses and sense of urgency. 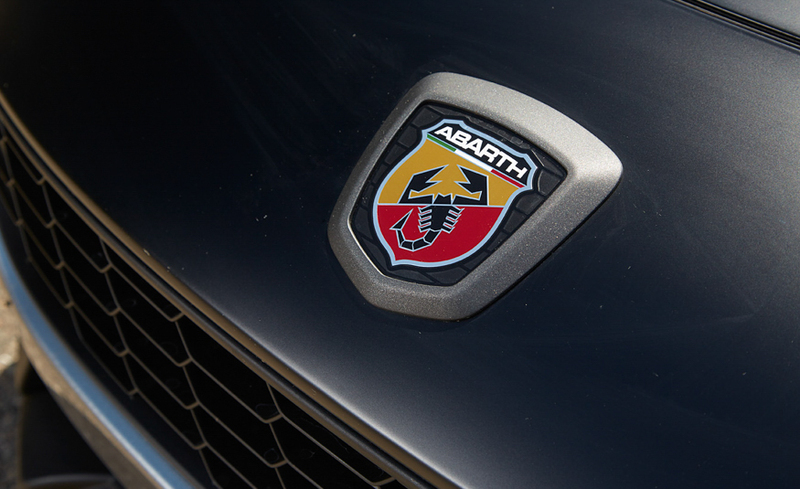 Abarth versions come with a less restrictive exhaust that helps add 4 horsepower versus the lesser Spiders. From directly behind, the quad pipes gurgle like a pygmy Dodge Viper's. From the driver's seat, there's a faint grumble, but the engine lacks the gravelly song of the Miata. At least the Fiat's generous insulation reduces the highway din. At a steady 70 mph, there's 75 decibels of noise, with the sound peaking at 84 decibels at full throttle. Loud compared with a family sedan, but quieter than the Miata, which is downright unpleasant when cruising at 80 mph. The Fiat's chassis parts reduce body roll compared with the Miata, which is a bit jerkier on corner entry. Some of the Mazda's nervous energy has been massaged out of the 124's electrically assisted power steering. The Fiat reads as larger than the Mazda because of the extra weight, the toned-down responses, and the view over the longer hood. On the skidpad, the Fiat's 0.87 g of grip falls short of the Mazda's 0.89. But shut off the stability control and the Fiat will go from neutral to lurid drift with a small squirt of the gas. Few cars make being Ken Block easier. Both cars came with identical and optional Brembo four-piston calipers in front and standard single-piston rear calipers. A firm and trusty pedal dials in the right amount of stop. Hauling down from 70 mph takes 171 feet in the Fiat and 175 in the Mazda. Different tires are likely to blame for the disparity. And blame our dusty desert test facility for the longish stops; our previous test of the Miata Club resulted in a 159-foot stop from 70 mph. On the road, the Fiat rarely had to brake for traffic. 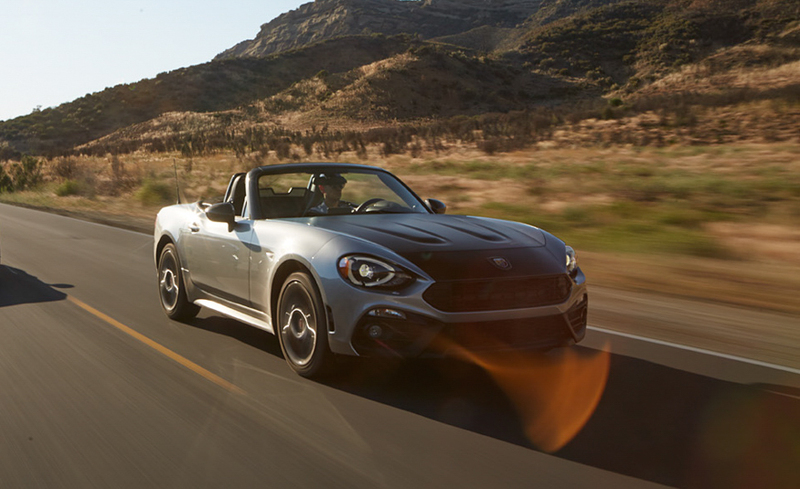 We're guessing that Fiat's optional ($1995) black hood stripe (which looks like a sticker, though Fiat assures us it is painted on) makes the 124 Spider look too much like Officer Friendly's car when seen through a rearview mirror. It's a modern miracle. The seas part. The Toyota Corollas move right. From other angles, the Fiat's longer overhangs and upright front end look awkward, but the extra 0.4 cubic feet of trunk space means that it can swallow another small bag. 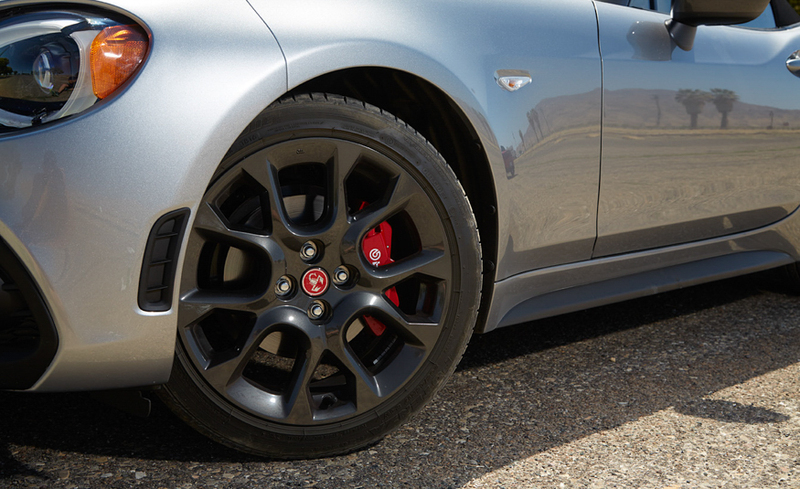 From behind, the Abarth's haunches and exhaust look mean until you notice the narrow tires. Someone skipped leg day. As noted, not much separates the two roadsters inside. The Fiat does have Recaro seats that Mazda is considering offering. They are excellent and more supportive than the cheaper-feeling and softer ones in the Miata. Score one for the Fiat. Does the Fiat come across as an Italian car? No, though a piece of black plastic trim did fall off the front bumper in a futile attempt to convince us otherwise. 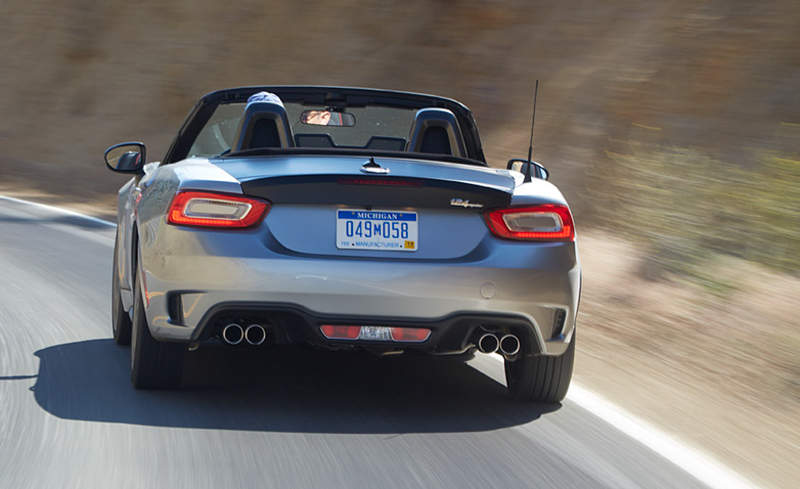 The 124 Spider strikes us as more like a heavily customized Miata than its own thing. We'll take the original. We fell hard for the Miata on that sunset drive down 33. Its slightly immature energy, somewhat annoying on a straight freeway, made us smile. Live-wire steering hurtles you toward apexes, and this car rolls over and wants to keep playing. The Miata never stops selling the case that smaller is better. Mazda has built a modern car that amuses like an old car. To pull off this trick, the Miata eliminates the thick veneer of refinement we've become accustomed to in new machines. Fiat puts some of that veneer back-not enough to transform the car, but possibly enough to make it more palatable to customers who don't remember the good old days so fondly. Without that extra layer of insulation, the Miata puts you closer to the machinery. The engine hums up front with a light burble from the intake. With the top down, the exhaust putters like that of an old Miata, which itself puttered like an MG. Shift efforts are lighter and more satisfying than in the Fiat. The clutch takeup is near perfect and easy to master. With no turbo in the way, the 2.0-liter is far more responsive than the Fiat's 1.4-liter. Horsepower and torque rise in a smooth and linear manner. Even with a relatively green engine reading just 898 miles, the Miata still outpaced the more powerful Fiat to 60 mph and through the quarter-mile. We prefer the Fiat's supportive Recaro seats to the Mazda's lightweight units. But the Miata's clear-eyed focus on driving pleasure wins the day. It didn't take us long to pick a winner. The Miata might be louder and jumpier than the 124 Spider, but it's also more charming and honest than the Fiat. And that means the Miata is a better sports car where it really counts.